LinkedIn is undeniably an important platform for distributing content. 94% of B2B marketers use LinkedIn as a content distribution channel, compared to just 89% on Twitter and 77% on Facebook and YouTube. On LinkedIn, you can post either promoted or organic content linking back to your site or product — while you can certainly use LinkedIn ads to target your audience and ensure higher visibility, you can also post content on your page itself for brand awareness, or to spread information on a new product or service. However, LinkedIn’s popularity among marketers means its a crowded space. To truly stand out, it’s critical you use the platform to share high-quality, compelling ads. To help you create ads that inspire your audience, we’ve compiled this list of nine fantastic LinkedIn examples — and why they work. Dell EMC’s advertisement is a humorous and accurate use of the hashtag #ThrowbackThursday. The ad showcases an image from the 90’s, and begins, “Thanks to our customers …”, which is a truly heartwarming display of Dell’s gratitude and humility over their own growth. To create a compelling ad, consider how you can make your content relatable to your audience. A good advertisement can draw positive attention to your brand without immediately trying to sell a product or service. For instance, take a look at Tableau Software’s ad, which spreads the word about the company’s commitment to ending veteran and chronic homelessness. Additionally, the image is authentic and sentimental, and draws attention to the ad’s purpose. How can you not want to click the link? I’m particularly impressed with Adobe’s commitment to negating stereotypes — for instance, in this ad, their text initially mentions leadership advice in general, before offering female-only executive tips in honor of Women’s History Month. The advertisement is also easy-to-skim, for LinkedIn users who are quickly perusing a page. In general, short-and-sweet does well on the platform, so this is a smart move. JetBlue’s advertisement is impressively simple, which enables the audience to quickly gather all necessary information — mainly, “20% off”. Additionally, “A springboard for Spring travel” is catchy and unique. 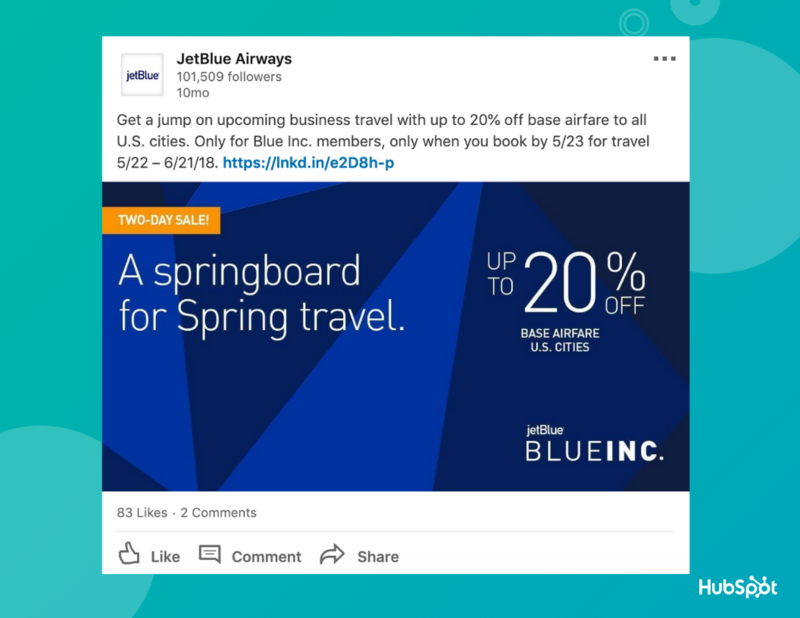 Most of JetBlue’s LinkedIn content avoids directly selling to their audience, so this piece doesn’t feel too promotional. Instead, it feels helpful. Plus, the “Two-day sale” creates a sense of urgency, and could compel an audience to begin perusing JetBlue flight deals. You might use LinkedIn to share helpful content with your audience. While not directly selling a product or service, this method undoubtedly helps you showcase your brand as a thought leader, and attracts more visitors to your site. Toptal, for instance, uses their LinkedIn profile to share helpful content related to their service. Additionally, Toptal’s content makes a general statement — “the modern workforce demands greater flexibility” — to attract a wider audience, and avoid seeming too promotional. As an alumna of Elon University, I might be a bit biased, but the university does a great job avoiding images and using graphics and videos instead to draw attention to their content. Since 59% of executives would rather watch a video than read text, it’s a good idea to include video in your promotional strategy on LinkedIn. Visa is another example of a company that makes good use of video on LinkedIn to promote new campaigns or programs. In fact, their videos are often addictive — like this one, which features a variety of women talking about their decision to start a business. The two-minute video is incredibly moving, and does a good job relaying the importance of Visa’s new Visa Everywhere Initiative. 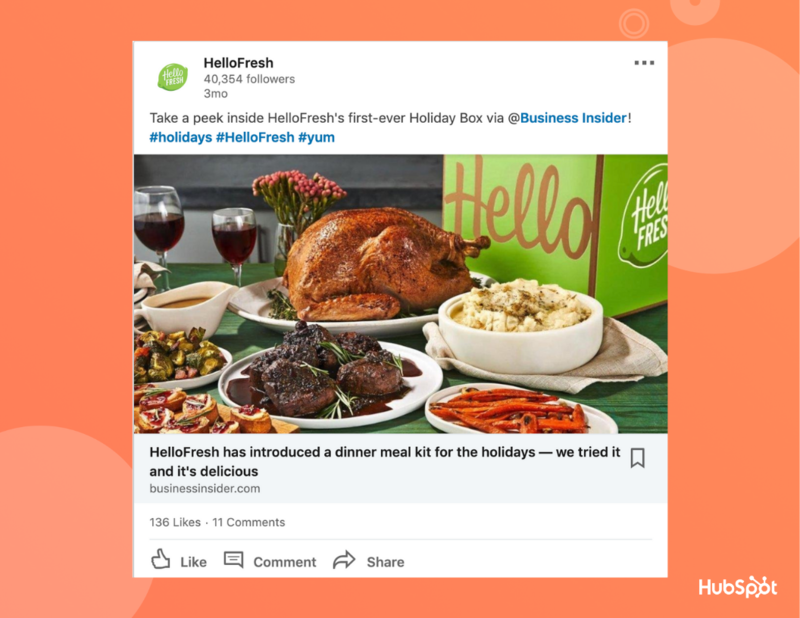 Since HelloFresh is sharing content initially published by another company, the ad seems particularly authentic and genuine. Additionally, the hashtags are fun and feel relatable, and the image conveys the ad’s meaning particularly well. 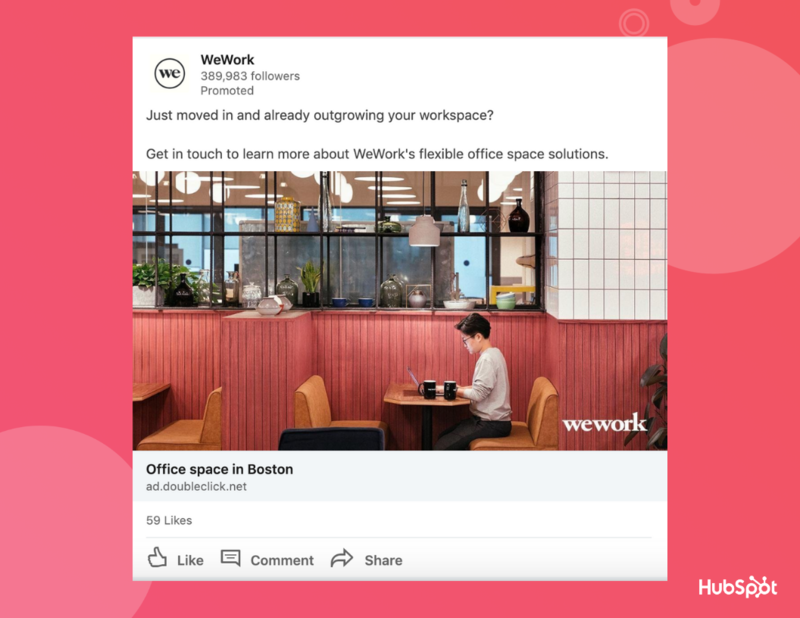 In an era of always shortening attention spans, brevity and simplicity is key — which is why WeWork’s advertisement is especially impressive, with short text and a simple image to convey its message. Additionally, the messaging, “Just moved in and already outgrowing your workspace?”, in conjunction with the image, is especially engaging and attention-grabbing.